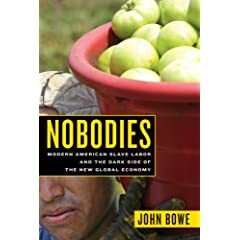 Nobodies: Modern American Slave Labor and the Dark Side of the New Global Economy. By John Bowe. Random House, 304 pp., $25.95. In ancient Rome the authorities created a torture device called “the brazen bull,” a life-sized metal statue of a bull in which they locked people accused of misbehavior. “A fire was built below the bull’s belly, and with careful placement of musical pipes within the bull’s head, the victim’s screams would be transformed into ‘music,’” John Bowe writes in Nobodies. Most of us like to think that such inhumanity has gone the way of the Caesars. But Bowe argues that spiritual descendants of the Roman torturers exist in modern employers who exploit migrants and frighten them into silence with threats of deportation, harm to their families back at home or other punishments. And the abuses he describes are no less chilling because his rhetoric about them at times becomes overheated. Bowe is such a fine reporter that if he had let facts like these speak for themselves, Nobodies might have appeared on every newspaper’s list of the 10 best books of the year. But he also tries to show that the growing gap between the rich and the poor, as exemplified by forced labor, undermines democracy. That’s true, but Bowe is much less effective as an analyst than as a journalist and can’t quite pull it off. In the third section of his book, on Saipan, he loses his focus and serves up something that resembles an investigative report less than a highly stylized travelogue of the School of Geoff Dyer. And in the fourth section he tries to link the stories in his book to global events such as the attacks on Sept. 11 in a way that comes across as simply glib. Bowe says on his blog that he wishes he’d written a simpler book, and it’s a perceptive comment. As good Nobodies is, it could have been better if he’d tried to do less in it. Furthermore: Parts of “Florida,” the first section of Nobodies, appeared in different form in the April 21, 2003, issue of The New Yorker. In 2004 Bowe’s work to date on the book won the J. Anthony Lukas Work-in-Progress Award and other honors. The plight of the Immokalee tomato-pickers led to a four-year boycott of Taco Bell, which ended in 2005 when its parent company agreed to give workers a raise that would nearly double their wages and take other steps to improve their working conditions. Bowe lives in Manhattan. Janice Harayda is an award-winning journalist who has been the book columnist for Glamour, the book editor of the Plain Dealer and a vice-president of the National Book Critics Circle www.bookcritics.org.